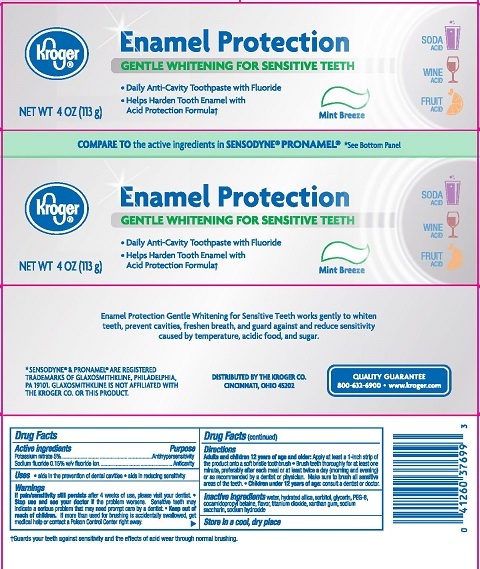 Proprietary Name: Kroger Enamel Protection Sensitive Gentle Whitening What is the Proprietary Name? Kroger Enamel Protection Sensitive Gentle Whitening with NDC 30142-362 is a a human over the counter drug product labeled by Kroger Company. The generic name of Kroger Enamel Protection Sensitive Gentle Whitening is potassium nitrate, sodium fluoride. The product's dosage form is paste, dentifrice and is administered via dental form. If pain/sensitivity still persists after 4 weeks of use, please visit your dentist.